If you came here for the Spellbinders' Summer Spectacular Blog Frenzy, please scroll down below or click HERE. Hi, friends. I'm taking a computer break for several days, so this is a pre-scheduled post. In fact, I have a scheduled post almost every day. Let's hope blogger won't fail me :). While I'm away, let's have a giveaway, shall we? It's been a while since I had one and I missed my 3rd blog anniversary a couple of months ago. Simply leave me a comment on my blog posts (one comment per post per person) from today until July 5th. I will pick 4 winners from the comments left on my blog to win the following prizes (one winner per prize). Everybody is welcome to comment and be eligible to win. I will announce the winners on July 6 right here. Due to the number of prizes being given away on my blog and my dependence on my mom to do the shipping, I have to ask that the winners email (via Contact tab above) me with their info within 4 days (till July 10) in order to claim the prize. This will help with organization and avoiding confusion. Thanks for understanding! Now onto my card...I'm showing you today my 2nd card using the Want2Scrap Silhouette - Old Time Tricycle with the ink splatter technique. As with my first card, I used the silhouette as a stencil. I just love the results, which give the illusion of multiple layers, esp with that collage patterned paper by Prima. I layered the card front with Want2Scrap Manilla tag which was stamped with The Craft's Meow's Simply Delightful stamp set. I added small banner strips from paper scraps on top of that. The sentiment is Want2Scrap Chipboard Sentiments- Words of Love covered in white pigment ink. 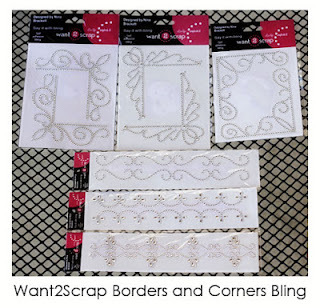 A vintage brad and some Want2Scrap Swirls, Finesse - Silver Rhinestones - 2 Pack - Self Adhesive finish the card. I have two more cards to show you using the same silhouette shape. In the meantime, enjoy your day! Beautiful card! I love the background you created! Great prizes - thanks forthe chance to win and enjoy your time off. lovely card...enjoy your time away to rejunvenate! How fun! We are leaving for a little rejuvenation time today also. Thanks for the chance to win some wonderful prizes! I just found your blog today and I'm so glad I did. What a beautiful card. good for you Nina, enjoy enjoy your break and thanks you for the chance to win these giveaway. Great card. TFS and a chance to win. I already ' Like ' all of the companies listed. Fabulous card Nina! I've already liked all the companies listed so thanks for the chance to win! Beautiful, bright card, Nina, thanks for the chance to win. I love the sewing labels to go along with my TCM set. Wonderful Card. Love the colors!! I hope you're having a lovely relaxing break or if it's not very relaxing that it will be a blessed and worthwhile time. I really love the Spellbinders Bauble Blossoms as well as all of your other designs. Thanks for a chance Nina! I'm a long time fan of the companies you're sponsoring. Enjoy you trip. Thanks for this chance to win some goodies! I love stopping by to see what you've been doing, just don't often comment. Enjoy the break away. What a lovely card - and sweet giveaways! Enjoy your little break - hope it's restful for you! Wonderful card and giveaway! Liked all you contributors and hoping for the best! Thanks for the op. Hoping you are enjoying your time off. Great card. Thanks as always for sharing. Thanks for the chance to win. Love your card. Great card, I just love Want2Scrap... they have great products. Hope your time off is restful, you deserve it. Tks also for the blog candy. What a neat card Nina. Love the background and all the other elements. Great colors too! Great blog candy give-away! What a fabulous card! I love the bright colors! What a generous blog candy! beautiful card. love the bling. tfs. Fun, happy card!!! I liked all the companies on FB! SUCH an adorable card, Nina! LOVE what you are doing with the bike silhouette! Lovely card and great candies. Very pretty card. Thanks so much for sharing! Congrats on your 3rd anniversary!! Love your creative style and esp. this creative card! Love it! Enjoy your vacation! Beautiful work Nina. Love the card and the colors! Gorgeous card! Love the cycle in the background! great idea-thanks so much for your inspiration! Thank you for the inspiration and for thinking of us while you are on vacation. Love the cards you made!! So pretty. Your Spellbinder designs are awesome too. Enjoy your blog time off. What a beautiful card! I always appreciate and am inspired by your cards! Congrats on you'd 3 year blog-iversary and thank you for sharing your talents! God bless! 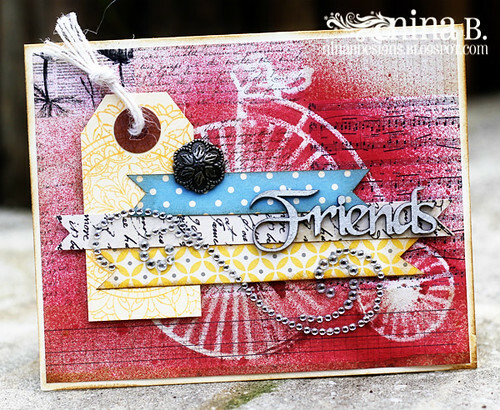 love the misting and layering on your gorgeous card! Your cards are always so vibrant and beautiful! Thank you for sharing your talented works with your followers! Thank you for the chance to win. I look forward to your email every evening to see what beautiful cards you've created. 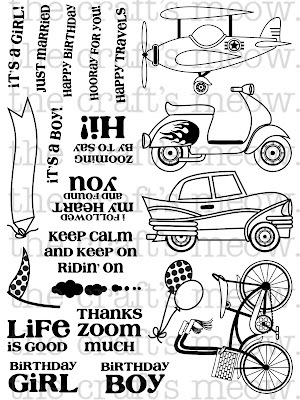 Fabulous--I really like the ink splatter for the tricycle. So glad that you're getting the chance for some time off Nina! Your giveaway is so generous and as usual I love the creativity of your card. Very pretty card! Thanks for the chance at a prize! Love your card and what a wonderful giveaway! Enjoy your time off and we will look for your scheduled posts. Enjoy your time away. 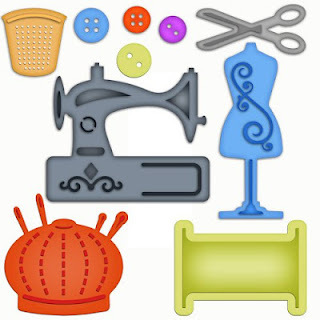 I would love to win the sewing elements die! Thanks for the give away. Fabulous card! I love the colors! I love your card, and thank you for the opportunity to win the blog candy. Lovely card. Thanks for another opportunity to win. Thanks for the chance to win these goodies, hope you had a good time away. Fantastic! Love the background you created with the cycle silhouette! Enjoy our time off the computer. Nice card. Interesting technique. 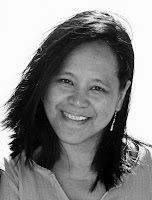 Congrats on your third blog anniversary! Time goes by so fast. I love your stamps. You are very talented and creative. Happy belated 3rd Bloggerversary! Fab card and candy! Generous giveaway, and GORGEOUS card! You never cease to amaze me Nina and I am so happy your getting a vacation!! Enjoy the time with your wonderful family because they grow up waaaaayvtoo fast!! Your card is awesome and I love the combination of colors, textures and just ALL of it!! Thank You for sharing and always inspiring! Your prizes are great as well. Take care and God Bless all of you. Nina I love the colour ink you have used with this technique. Your card is stunning with all the detail you add - you are a gifted artist. Wonderful card! Thanks for the fabulous prizes and the chance to win something! Have fun in your vacation! Great splatter technique and great card. Your card is amazing - love all the details & techniques. Thank you for creating this wonderful & fun opportunity. i love the spatter that you did. will we get the positive of the trike soon? great layerss and cute baubles. enjoy your computer break. Fabulous card. I really like the background you created with the misters. I just bought my first misters and haven't had a chance to try them out yet. Thank you for the chance to win an awesome prize. Very generous. Wow! The card is amazing! I love how you did the bicycle in the background. 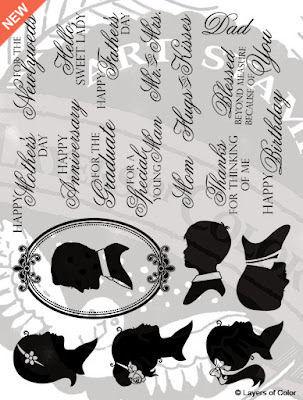 gorgeous card - love the tricycle "mask". So creative!! Beautiful card. I liked background very much. Beautiful card! Enjoy your break! And thanks for the chance to win! Thanks for the chance to win candy! I love your backgrounds, they rock! Great card! Very different!I always enjoy your creativity. I just love your old fashion style card...the colors are so bright and cheery...I would be over the moon to win your silhouette set....I haven't found anyone who has it for sale. It would be an awesome re-release! Love the layers with the double ended banners and touch of bling! Great card. What a wonderful giveaway and a GORGEOUS card! Love the beautiful rich colors and fun bling! I love your splatter card! Great give-away, too! Beautiful card, Nina! Really cool background! Thank you for the chance to win! I'm subscribed via Reader, and even even when you are away, I still get new post every day. Thank you so much for scheduling these posts in advance! great card, have a great time off! love the splattered card! will have to practice this to use on card myself. Thanks for sharing. Your card is Amazing! I loved! I hope to win the candy! Thanks for te chance! Love the splatter card. Thanks for the giveaway! Beautiful card, I want to incorporate more tags in my cards; this is great inspiration. The second bicycle card for me to see now has me hooked! I love this card. 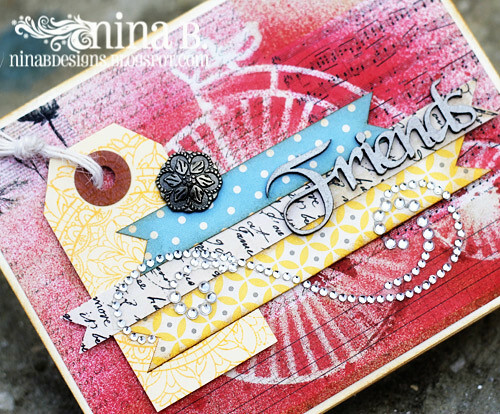 The chipboard sentiment is perfect! Beautiful card Nina. I have been looking at all of your amazing cards and this is another great one! I love that tricycle image and the bright colors!